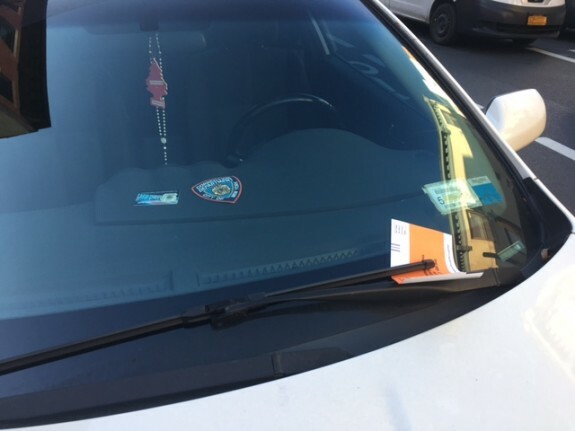 Speaking at a Brooklyn Chamber of Commerce event this week, NYPD Commissioner James O’Neill fielded questions about placard abuse on Atlantic Avenue, which has been a drag on Downtown Brooklyn businesses for years. 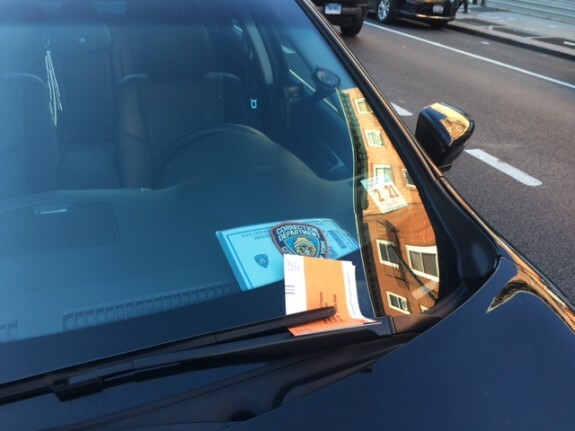 Businesses on Atlantic Avenue in Boerum Hill have complained that they are losing customers because so many city workers are using phony permits and other city ID to park for free all day, according to the Atlantic Avenue BID, the organization that represents more 300 businesses along the avenue. “I’ll have a conversation with [Deputy Inspector] Sergio Centa of the 84th Precinct and rectify that,” O’Neill promised. “My own precinct up in the 44, we had a similar problem …. We cleaned up the situation. I’ll talk to Serge,” he said. It looks like O’Neill and Serge had that talk. Reader Justin Pollock snapped these pics this morning on Smith Street, which crosses Atlantic at the Brooklyn House of Detention. Some of the cited vehicles had Department of Correction placards, while others had clothing bearing the DOC shield placed on dashboards. “I counted 15 tickets just on the east side of the street,” Pollock told us in an email. 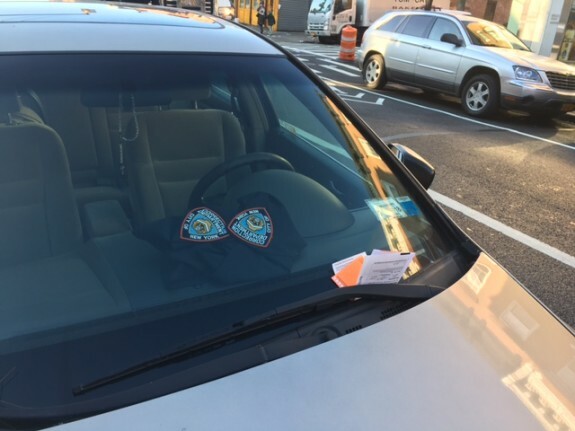 We’ll see if the 84th Precinct will keep up enforcement, or if O’Neill will take other steps to finally address the illegal parking scourge. But it’s another sign that NYPD can curb placard abuse when it wants to. 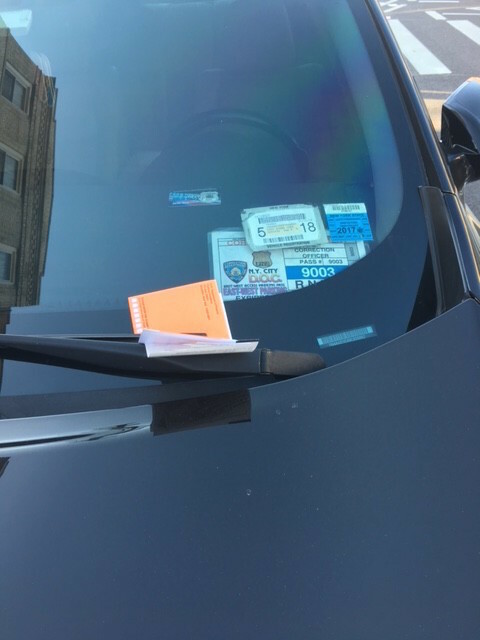 Street Cheats: Parking Enforcement in Downtown Brooklyn? Fuhgeddaboudit. Today’s installment of Street Cheats takes us to Downtown Brooklyn, where city workers are using a rehabbed Cadman Plaza as their personal parking lot and the 84th Precinct has ceded Red Hook Lane sidewalks to government employees and other space hogging randos.